From Bloomberg. 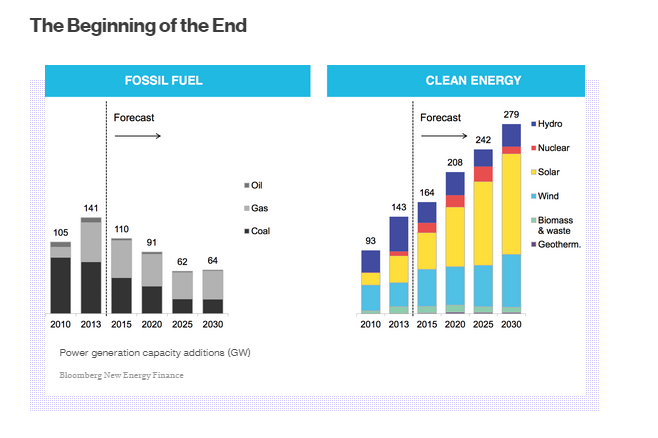 They are saying that , for the first time in 2013, the world added more renewable energy capacity, 143 gigawatts, than the conventional fossil capacity, 141 gigawatts. The driving force behind this development is the dramatic drop in the cost of solar panels as well as other technologies. Gridparity has already been reached in many parts of the World which means that the little guy can generate his own power at a cost below what he has to otherwise pay to Hydro. For my international readers I must point out that Hydro in Canadian English means electricity, not water! If this prognosis 30 years in the future is entirely correct, in a World where many economists are challenged to even predict the past, is neither here nor there. The trend at least is perfectly clear. Add to that the electric car – an affordable one! – and greener office buildings and all of a sudden the future of oil and coal becomes much clearer. The critical force in this development is the small scale at which this conversion process can spread like wildfire.